Spend a day away from the hustle and bustle of Las Vegas to experience the raw and natural beauty of the Grand Canyon South Rim. Words and even pictures cannot fully describe this stunning gift of nature. First photographed by Timothy O’Sullivan in 1871, we continue trying to capture the beauty of this geological wonder, but nothing compares to seeing the Grand Canyon in person. 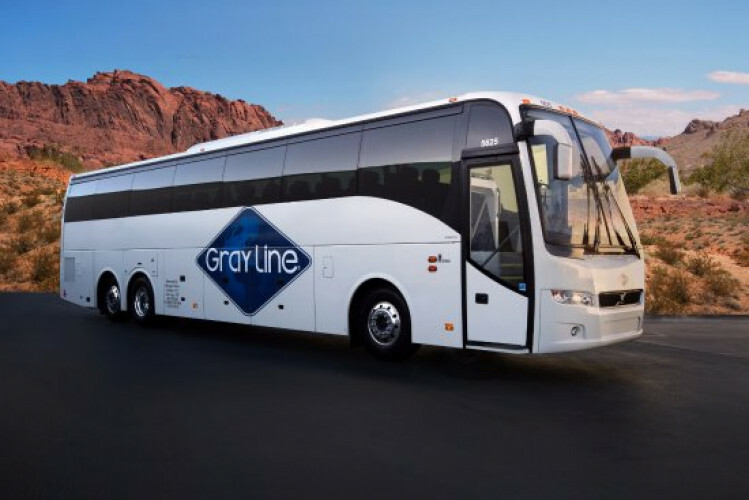 Gray Line has been providing Grand Canyonsightseeing excursions since 1947, so it’s fair to say that we've mastered the amazing tour experience to ensure you have the best possible touring experience. Considered by many to be the “true Grand Canyon,” Grand Canyon National Park’s South Rim features the vast, expansive views most often seen in magazines, websites, Facebook and on TV. From the South Rim, you can experience the Grand Canyon from close to two dozen viewpoints, each with their own unique attributes, and many that allow you to peer all the way down into the heart of the Grand Canyon, the Colorado River. Approximately 5 hours from either Phoenix or Las Vegas, the South Rim is the most easily accessible from most major Western cities. Commuter flights are also offered into nearby Flagstaff, Arizona or Page-Lake Powell, Arizona. Grand Canyon South Rim is most frequently chosen by first-time visitors to the area not only for its beautiful views, but for its abundance of visitor services and family-oriented activities. The South Rim is open year-round. At 7,000’ above sea level, the South Rim has four distinct seasons. Summertime is predictably warm and dry, with afternoon monsoon storms occurring during the months of July and August. Daytime highs run in the 80’s and 90’s during the day, with nighttime lows in the 40’s and ‘50’s. Spring and fall are the by far the best times of year weather-wise, with afternoon highs usually a picture perfect 65-75 degrees. Nights can by chilly, with lows in the 20’s reported during times usually considered to be summer, so a coat is best carried no matter what time of year you visit. March and April are prone to late season snowstorms; similarly, September typically gets those last few “gully-washers” of monsoon season. In wintertime, Grand Canyon National Park almost becomes a different world. Daytime highs run in the 30’s and 40’s, with subzero nights not unheard of. Snow is possible year-round at the Grand Canyon, but the heaviest amounts typically fall between December and February. While the Grand Canyon looks spectacular by itself, the sight of the great gorge draped in a mantle of white has been known to move people to tears. By the 1950’s, Grand Canyon South Rim’s popularity had grown to the point where more lodging was needed. The town of Tusayan, 7 miles outside the park, began to fill that void with the construction of the Red Feather Lodge in 1963. The Best Western Grand Canyon Squire Inn and the Quality Inn Canyon Plaza opened in the 1970’s, and the Holiday Inn Express and the Grand Hotel arrived in the mid-1990’s. Each hotel (except for the Holiday Inn Express) has its own on-site restaurant and gift shop, plus you’ll find a wide variety of chain and independent restaurants as well as an internet café and General Store in Tusayan. Tusayan is also the site of the Arizona’s second busiest airport – Grand Canyon National Park Airport – and the world-famous IMAX Theatre. Many Grand Canyon area tours, such as jeep tours, airplane and helicopter tours, and rafting tours originate from Tusayan. Grand Canyon South Rim is also recommended for those traveling with young children, as there is more for them to do – and more that they can do – at the South Rim than at the North Rim or West Rim. Day tours to Grand Canyon South Rim are available from Las Vegas, Flagstaff, Phoenix/Deer Valley and Sedona. Hotel reservations should be made 6 to 9 months in advance during peak travel season.